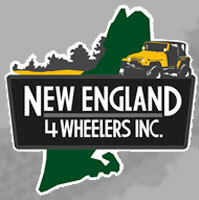 The New England 4 Wheelers, Inc. is a family oriented four-wheel drive club created to promote the sport of recreational four wheel driving on primitive roads. Vehicles are limited to Jeep type sport utility vehicles that are narrow, lightweight and agile like Jeep CJ, Yj, TJ, Cherokees, Suzukies, Defender 90s, Scouts, and other vehicles of these genera. Vehicle size is limited to 70 inches at its widest point. There is no limit to wheelbase length, but it is recommended not to exceed 106 inches due to the break over angle. A tow hook is mandatory in the front of the vehicle. A hook or attachment point is required for the rear. All vehicle MUST carry a tow strap with loops (no metal hooks) rated at least 20,000 pounds, at least 20 feet in length, a 40 channel CB radio, fire extinguisher, full size spare tire, and first aid kit. Metal whip antennas are not allowed. Maximum antenna length is not to exceed six feet in length. Open topped vehicles must have a roll bar. All vehicles must have seat belts for all occupants. Minimum tire size is 31 inches. Maximum tire size allowed is 38 inches. A spare tire of equal diameter to your road tires is mandatory.